Today PowerCLI 5.0.1 has been released. Normally with a .0.1 release you will see small bug fixes and performance increases. 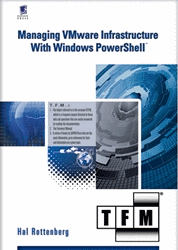 This is the case with this release, there are indeed bug fixes and performance increases but there is also something very exciting… PowerShell Cmdlets for managing VMware’s cloud solution – VMware vCloud Director. The latest bug fixes and other enhancements can be found in the change log here, this post will mainly cover what's new from the vCD PowerCLI snapin or VMware.VimAutomation.Cloud snapin. With the addition of vCloud Director Cmdlets to the PowerCLI snapin administrators are now able to automate their cloud deployments and report on key metrics. Using PowerShell's ability to easily integrate with other applications and export to multiple media types, vCloud Director can now be expanded with simple easy to understand code designed towards the system administrator. Included in PowerCLI 5.0.1 you will now see a new snapin called VMware.VimAutomation.Cloud, this will contain the cmdlets used for working with your vCloud Director deployment. This initial release of the cmdlets will mainly focus on the reporting aspect of vCD or the “Get Cmdlets”. History has shown us that this is a place where most administrators start with a new PowerShell cmdlets as it is easy and safe – you are not going to accidently cause any issues just by reading data! As well as the “Get Cmdlets” you will also be able to use cmdlets designed for importing virtual machines from the underlying vSphere environments and searching cmdlets which will allow you to search for specific objects within your cloud. Advanced users of PowerCLI will be familiar with the Get-View Cmdlet currently available for vSphere. For vCloud Director, Get-CIView will offer a similar type of interaction, opening up the entire vCloud API to enable tasks which are part of the vCloud API that do not yet have a specific cmdlet. As always you can find out more information on these cmdlets using the Get-Help cmdlet within PowerCLI. Connects to the specified servers. Disconnects from the specified cloud servers. Retrieves the specified cloud catalogs. Retrieves roles in the cloud. Retrieves virtual appliances in the cloud. Retrieves the virtual machines on the cloud. Retrieves the specified cloud provider VDCs. Imports a virtual machine from vSphere to a cloud. Imports a virtual machine or an OVF package from a vSphere server to the vCloud as a virtual appliance template. PowerCLI 5.01 can be downloaded from the PowerCLI download page here. Stay tuned for more blogs explaining how to use these new cmdlets. This entry was posted in Uncategorized on January 9, 2012 by Alan Renouf. Brother is a Japanese based company which deals in the manufacturing of low-cost printer globally. This company already registered its solid presence in the printer market with lucrative and attractive offerings. Brother Printer radically comes with a handsome price tag and offer good performance on the other hand. On the contrary, we got hundreds of mail every day from the users regarding the Brother Printer issues. Brother printer could be a really messy machine once its deals with technical errors. Frequent paper jams, poor print quality, and toner problem are the few typical issues that ruin the printing experience of the users. Getting an instant support from the reliable tech support firm is the most conducive option in this case. To avail that, just dial Brother printer customer number today and resolve all your queries regarding your machine quickly.